A wet start at Kentucky Speedway that delayed the XFINITY Series race until Saturday ended with a Toyota-dominated double-header. What looked like a runaway win for Martin Truex Jr. was complicated when Kurt Busch’s engine threw a tantrum in the closing laps. Truex, of course, held on, while we pointed our thumbs upward and downward throughout moments and story lines of the race. Throughout the years of auto racing, one thing has become evident: It is better to pass other cars than to be passed yourself. That’s why this week’s first thumbs-up goes to someone who passed a lot of cars: Kyle Larson. First, Larson started last after not making a qualifying attempt. In the opening, he passed lots of cars (he’s Kyle Larson, you see). Unfortunately for Larson, he was caught speeding on pit road during an early caution period, sending him to the back of the pack to do it all over again. And he sure did. 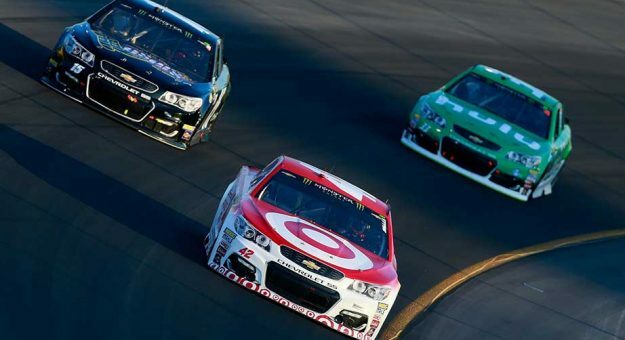 Between his two tours to the front, Larson made 90 green-flag passes in total. His No. 42 ended up finishing second behind the untouchable Martin Truex Jr. and his demon car. In a 40-car field, passing 90 cars under green seems like a lot. Thumbs up for showing off, Kyle Larson. Where passing cars is important, something equally important for NASCAR success is to avoid crashing. You see, when you crash, it is difficult for your car to go fast (unless your crew is exceptionally skilled with making duct tape-based repairs). Kasey Kahne tangled with Trevor Bayne on Lap 93 at Kentucky, ending Kahne’s night. This is the fifth time in seven races that Kahne has exited due to crash damage. Kasey, it’s time to stop going home and walking under ladders with your black cat, or spilling salt on broken mirrors, or whatever it is you’re doing. Most of these recent crashes have been totally unavoidable, so the only explanation for this spell of bad luck is that Kahne has a bad habit of relieving stress by opening umbrellas indoors. Thumbs Up: Martin Truex Jr. So far today, we’ve learned that in order to succeed in NASCAR, in addition to going fast, you need to be able to pass cars (like Kyle Larson) and not crash (unlike unlucky Kasey Kahne). Martin Truex Jr., of course, followed this advice and dominated Saturday’s race at Kentucky — even after staying out on old tires after a late-race caution. Truex earned his third “winner” sticker of the season— and his 12th and 13th stage wins of the year after sweeping the event. It’s probably a good thing that winner stickers are only awarded to race winners and not stage winners, since Truex would have probably run out of space on his car by now. A bonus thumbs-up goes to Truex’s crew chief, Cole Pearn, for having good taste in music. To make an understatement, driving a NASCAR race car seems like a chilling experience. Driving around dozens more race cars at the same time multiplies that level of fear. Now, try watching a screw holding your windshield in place suddenly fly off your car while you’re racing at full speed. That’s what Dale Earnhardt Jr. experienced. The thought itself earns a thumbs-down. Sure, the genius engineers who design race cars look for any possible advantage to gain speed, but this is a new one. It seems like more of an ideal situation to race with a windshield than without one, but I’ll leave those decisions to the experts. With a healthy Aric Almirola looking ready to hop back in a race car, it’s possible Bubba Wallace’s role as substitute driver in the No. 43 could end soon. Wallace made his first four Monster Energy Series starts for Richard Petty, each time improving his finish — culminating in an 11th-place effort at Kentucky. He’s driven four solid, low-drama races, which is impressive for any rookie — let alone for a single-car team. If he’s not in a car again soon, we’ll at least hope his Richard Petty Motorsports sponsor hooks him up with plenty of bacon.